The United Kingdom Post Office introduced the first public telephone kiosk, designated K1, in 1921. These were constructed out of pre-cast concrete sections, had a four-sided rectangular form with a pyramidal roof, and was topped by a wrought iron spear. It was not a particularly bad design, but somehow, it didn’t appeal to the British public. The London Metropolitan Boroughs as well as the Birmingham Civic Society voiced their dislike and even resisted the Post Office’s effort to erect K1 kiosks on the streets. To ease the tension, the Royal Fine Art Commission intervened and offered to organize a competition to design a new kiosk. 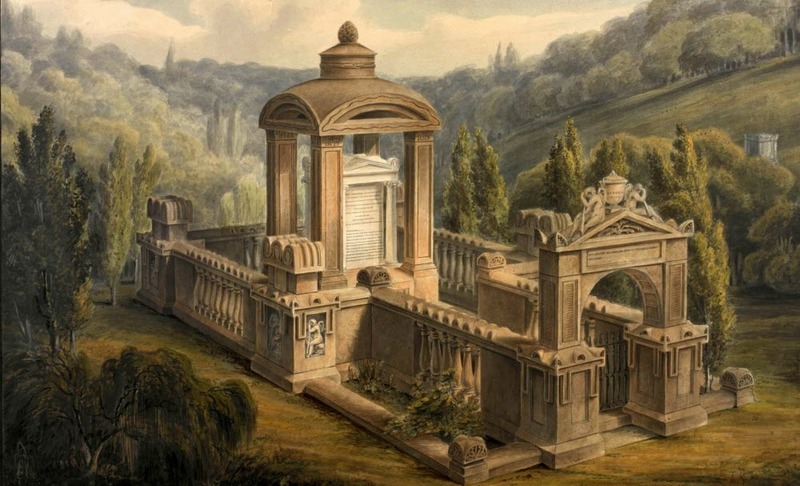 George Basevi’s painting of Eliza Soane’s tomb. The organizers invited entries from three respected architects—Robert Lorimer, John Burnet and Giles Gilbert Scott, along with the designs from the Post Office and from The Birmingham Civic Society. Robert Lorimer was a Scottish architect who designed the Scottish National War Memorial at Edinburgh Castle. John Burnet—another Scott—designed many prestigious buildings across Britain. Giles Gilbert Scott was a well-known English architect who gave Britain many of its popular landmarks such as Cambridge University Library, Lady Margaret Hall, and the Battersea Power Station. His most popular creation was the ubiquitous red telephone box. Scott designed a four-sided rectangular box with a domed roof. Each side had fluted architrave moldings at the outer edge, and at the base there was a blank rectangular panel with trim molding-surround. Above, on three sides of the kiosk, Scott put six rows of three small rectangular panes of glass, with trim moldings and internal beading. Above the main body of the kiosk was an entablature, set back from the face of the kiosk, and finished with a crown-molded cornice. The entablature carried a rectangular illuminated telephone sign, and above it, on the pediments, Scott carved the Tudor crown. 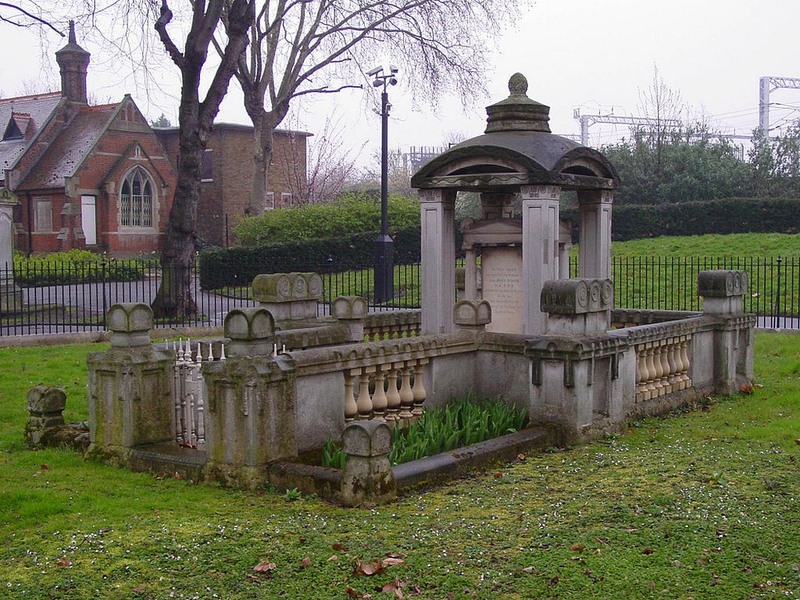 The K2’s design was largely inspired by the mausoleum of Eliza Soane, wife of Sir John Soane, at the Old St Pancras churchyard in London. Sir John Soane was one of the most renowned architects of his day. Some of his finest works include the Bank of England (later rebuilt), Dulwich College Picture Gallery, and his own house in London which is now Sir John Soane’s Museum. 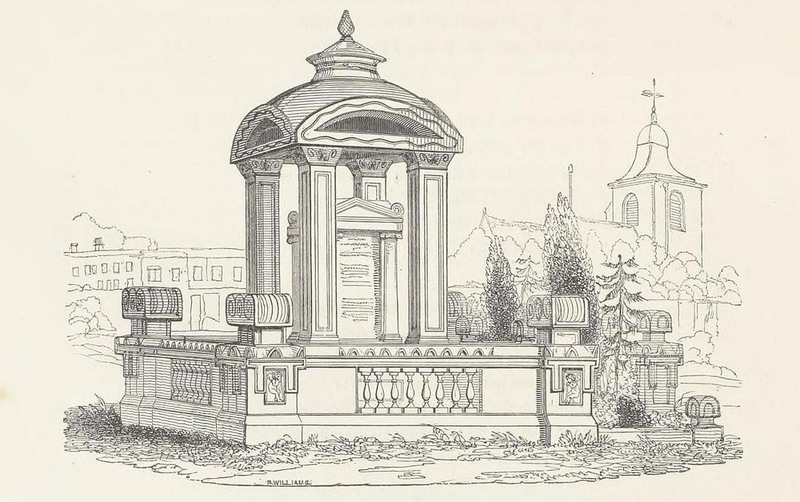 When Eliza Soane died in 1815, Sir John interred her in the churchyard of St Pancras Old Church, and built a tomb above the vault. Designed by Sir John himself, the tomb comprises a central domed structure supported on four paneled piers with ornamental capitals and four columns decorated with a style of Soane’s own creation. The roof has a pine cone finial, the symbol in Ancient Egypt for regeneration, below which is carved a serpent swallowing its own tail, the symbol of eternity. There are also carvings of boys holding extinguished torches—symbols of death. Sir Giles Gilbert Scott knew the tomb well. In fact, he had just become a trustee of Sir John Soane's Museum. K2’s design was well received by the Royal Post Office. Giles Gilbert Scott originally wanted the K2 to be painted silver, with a blue-green interior, but the General Post Office chose red. About 1,700 kiosks were produced and installed mostly around London, before the Post Office realized that the K2 was too big and costly to produce. 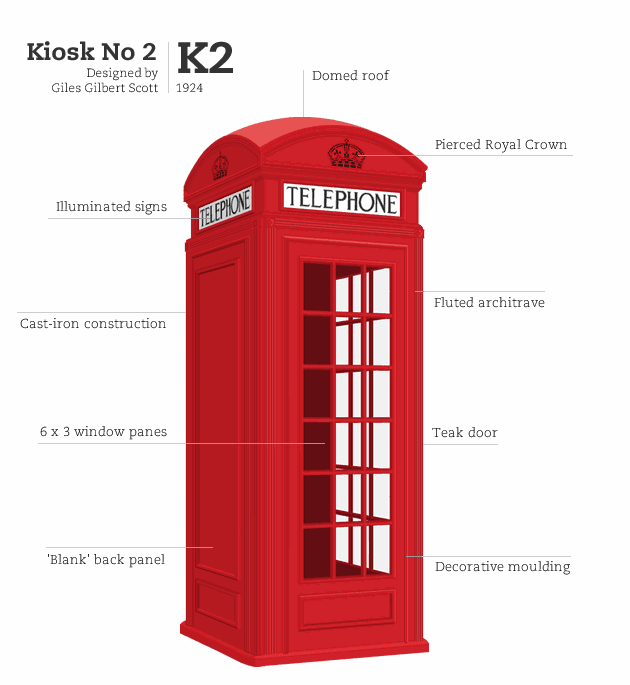 In 1929, five years after the K2 was introduced, Giles Gilbert Scott produced a revised design, the K3, that was similar to K2 but smaller and with less classical architectural styling and thus more cost-effective. The design of the telephone kiosk continued to evolve, but the structure remained the same—a rectangular box with a domed roof. Over the years the telephone box became a British cultural icon, and although their use has diminished over the years, hundreds of them still stand all around Britain.